A rather unusual group of plants Cussonia are grown for the foliage and range from smaller growing species suited to container growing to medium to large sized trees. The crowns tend to look a little like large cabbages hence the common name. Despite the relative unknown nature, some very old specimens can be found growing in various area of Australia. Cussonia are originally from South Africa and are remarkably drought tolerant once they are established. Usually found growing in rocky ground, all species will form a swollen stem below ground which helps them to be extremely drought tolerant. Although a number of species exist, only a few are offered for sale, and even these only from selected nurseries. C. paniculata is large growing, with a broad spreading crown and reaching a height of 7 – 10m it makes an excellent shade tree that requires little water during our long dry summers. 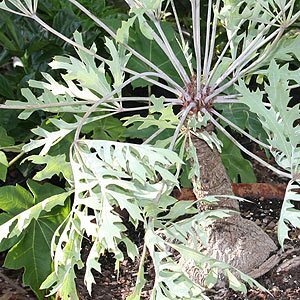 Foliage is attractive, a green to grey and lacy or dissected. The foliage forms to the top of the tree creating a good canopy. C. spicata is another that has been grown for many years with one excellent specimen found at Melbourne University in Parkville. Spread – Will spread to 4 metres over time. Foliage – Grey / Green. Cussonia thyrsiflora is a smaller growing species. C. natalensis (Rock Cabbage) will reach around 5m in height and can be grown in containers. C. zuluensis can reach around 10m over time.